This post originally appeared nearly three years ago (next week to be exact!) but I wanted to update it a bit and share it with all of my newer readers. Now that summer is here, you’ll no doubt be looking for fun ways to keep the kids from spending too much time with electronics and get them thinking and doing something else! These 25 Awesome Foodie Fun Ideas for Kids are a great way to learn all kinds of fun things, get kids into the kitchen and have some fun along the way. 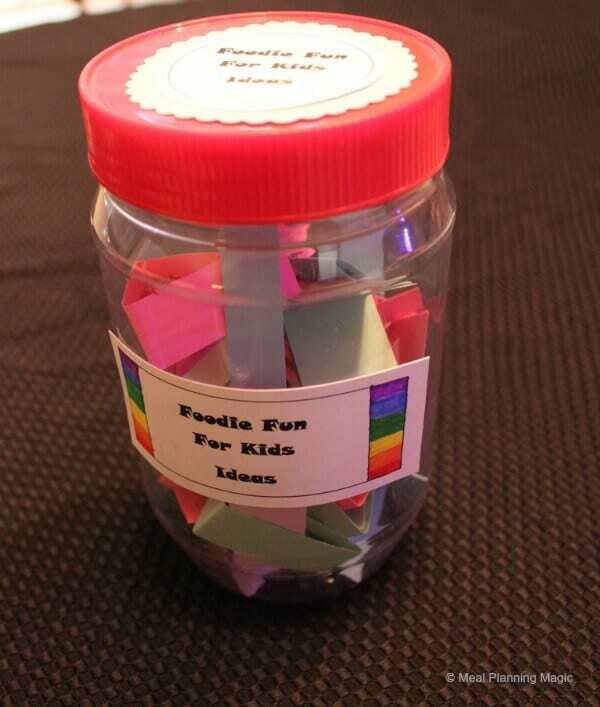 I’ve got the list of ideas below AND have included a Free Printable so you can create your own jar full of activities. Which one will you start with first? For the last couple of years, we have created Summer Bucket Lists. Wanting to get my kids in the kitchen a little more is always on my own list! Bucket lists area a fun way to set some goals to make some memories and spend time together too. At the end of summer, it’s neat to look back and see what we’ve actually done and where we’ve gone! We’re going on three weeks since the official start of summer here (a.k.a. school’s out!) 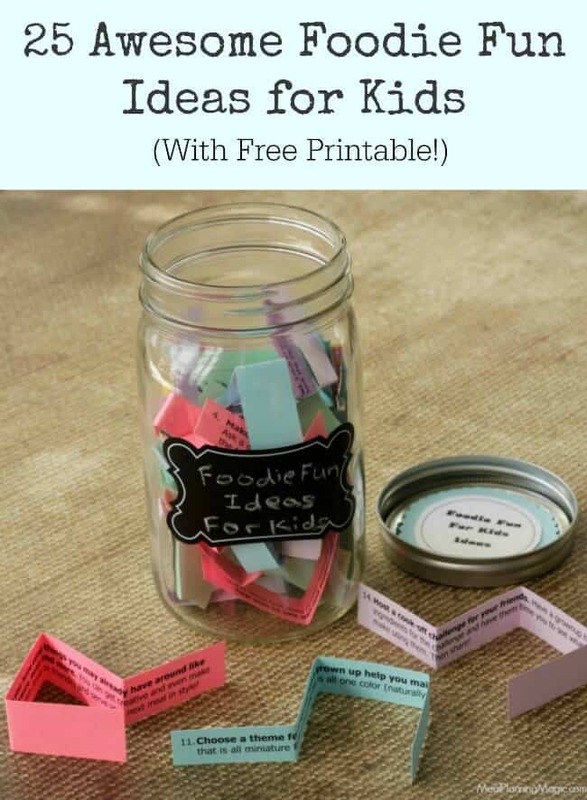 and while we’re not quite lacking for things to do, I know before too long I’ll be hearing the familiar cry of “Mom, I’m bored!” So, in the last month or so, I’ve been seeing several different ideas for Boredom Jars on Pinterest like this one or this one. 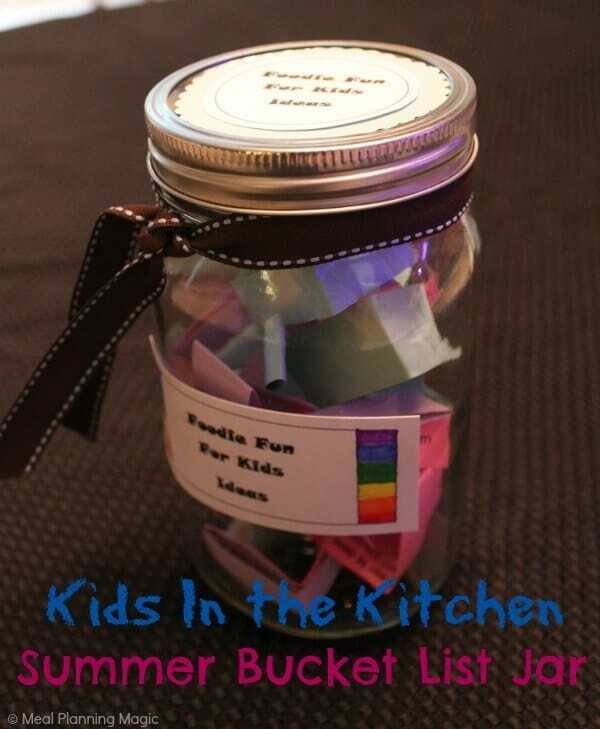 The idea is that you make up a list of ideas for your kids to pull from a jar when they exclaim “I’m bored!” and more screen time is just not going to cut it anymore! I’ve got one of those in the works (just need to print out the strips) but from all the ideas I saw, no one really had any that were food related to encourage kids to get cooking or learning about food! 25 Ideas and Activities–Free Downloadable! 25 Ideas To Get You Cooking! Note to Kids: Ask an adult to help you with cooking especially if you need to use a knife, oven, stovetop or other tools that can be dangerous. All ages can do these activities—younger children may need more adult help than older children though. 1. Learn how to cook something new. Then name your signature dish a fun name and serve it to your family or friends. 2. Look at a globe or world map and choose a country to learn more about. Then learn how to make a classic dish from that country. 3. Go to a Farmers’ Market. Find one near you by visiting LocalHarvest.org. What new foods will you discover? 4. Make a meal plan for one day for your family: breakfast, lunch, dinner and a snack. Ask a grown up to help you get the ingredients to make the meals for that day. Don’t forget the fruits and vegetables! 5. Set up a restaurant in your home using things you may already have around like placemats, napkins, silverware, music and more. You can get creative and even make and decorate menus for your guests (family or friends) and serve your next meal in style! 6. See how many different colors of fruits and vegetables you can eat in one day. Check out Crunch A Color or Today I Ate A Rainbow to help you keep track. How many can you eat? 7. Keep track of how much water you can drink in one week. Set a family goal to drink a bathtub amount of water (5,000 8 oz. cups!) and see how long it takes you to reach that goal! 8. Go fruit picking at a local pick-your-own farm. Find one near you by going to PickYourOwn.org. 9. Learn how to cook something new from scratch that you might normally buy (like macaroni and cheese, chicken nuggets, pizza, spaghetti, etc. )—no boxes allowed! 10. Have a holiday themed cooking party. Any day is a great day for a party—choose a holiday and menu, invite over some friends and cook together! 12. Have a bake sale and choose a cause to donate the money too. Some ideas: Cookies for Kids Cancer or Share Our Strength. Don’t forget the healthy goodies too, and even treats for pets! 13. Watch a cooking show on television, online or on video. We like Food Detectives, Food Network’s Challenge, The Chew and Good Eats. 14. Host a cook-off challenge for your friends. Have a grownup help choose some “secret” ingredients for the challenge and have them time you to see what delicious things you can make using them. Then share! 15. Watch a movie and then make food around that theme. Like African food for Madagascar or Chinese food for Kung Fu Panda. 16. Watch a cooking how-to show. Then make something you learned from the show. We like ActivityTV (DVDs and online). 17. Go to a food festival. Look in your local newspaper or online to find one near you. What else can you learn about the theme? 19. Learn how to read a nutrition label. The website Nourish Interactive has some great printables to help you learn how! 20. Pick a fruit or vegetable to learn more about. Make something using that as the main ingredient and share with your family what you learned about it like where it is from or what vitamins it has in it. 21. Read a food related book…it can be a cookbook or a fiction book. Your local library has lots of cooking books for kids! 22. Go on a grocery store tour. Ask your local store if they do this (Whole Foods is one that does in our area) or visit Field Trip Factory to find out about others. Get a group of friends together and make it a fun outing! 23. Interview an older family member and find out what their favorite foods were when they were your age. 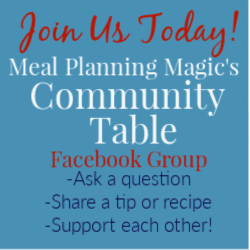 Help make a meal using some of those foods. 24. Find out where your food comes from. For example, when you buy produce, it will have a little sticker or sign that tells you how far it came. Meat and fish will often have a little sign that tells where it came from (or ask the butcher to tell you). Keep track for one week on a map to see how far things traveled to get to you. Then try to find foods that travel the least for the next week. I’ve made it simple for you by providing a PDF file of the list here for you to print out and another PDF file here to print the jar labels here. 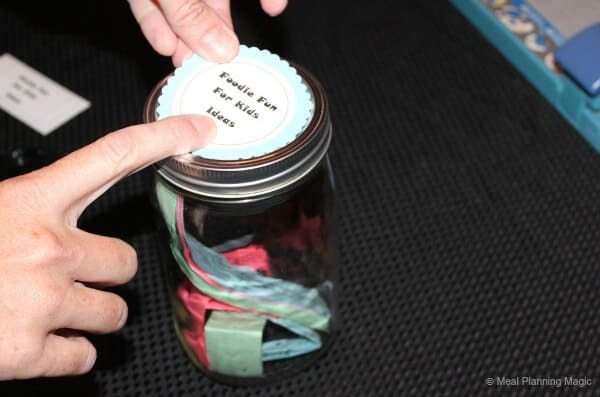 I just printed our list out on different colored paper, then cut them into strips, folded them up and added them to the jar. I added a label to the top and front and tied a cute ribbon on the jar. My daughter colored the rectangular label with rainbow stripes but feel free to add any fun design you want! I used a Mason jar because I happened to have a few extras but you can also repurpose a plastic peanut butter or mayonnaise jar (especially good idea if you have littler ones and you don’t want to worry about the possibility of glass breaking!) I think this whole thing took me less than 15 minutes to complete! 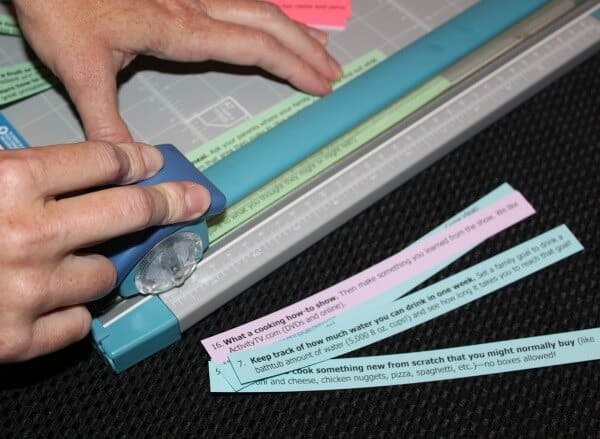 Using a paper cutter makes cutting up the list and labels quick and easy. I used my Cricut machine to cut out the circles but you can use a jar lid to trace the circle and cut out with regular scissors. I used decorative edge scissors for the design on the blue paper. Reuse a cleaned out peanut butter jar if you want something that is shatterproof-better for little ones! I can’t wait to get started on our list this summer! Which one will you do first? I hope you and the kids in your life enjoy this little project. that is just so fun! We don’t start summer for another week or so, but this will be in the back of my mind for then.